WEST LAFAYETTE, Ind.  Six months and 125 steps was what it took for a team of Purdue University students to win local bragging rights and the chance to compete for a national title in inefficiency. 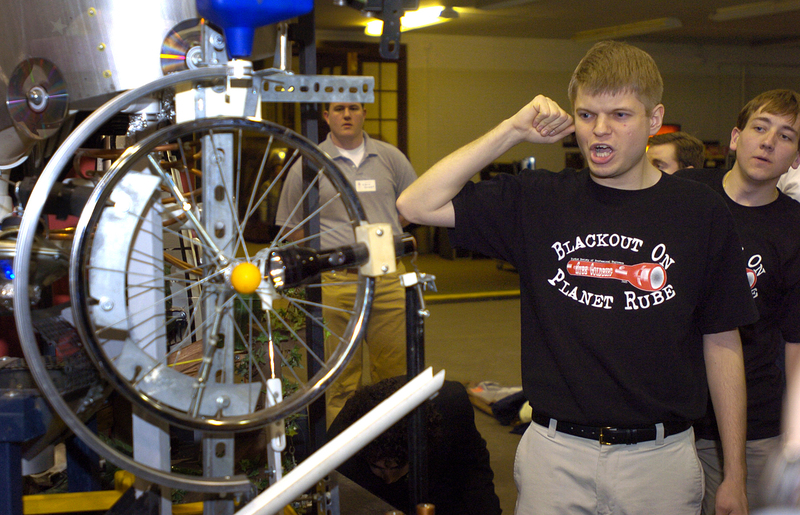 A machine built by the Purdue Society of Professional Engineers employed an outer-space theme and used steps that incorporated a bouncing water balloon, a fireman action figure fleeing a fire and weights attached to a spinning bicycle wheel to win the 22nd annual Purdue Rube Goldberg Machine Contest today (March 5). "When a lot of people see a Rube Goldberg contest, they think of it as something they couldn't do," said Kevin Hollingsworth, co-captain of the winning team. "Going to outer space is also something a lot of people think of as impossible for them to do to. We wanted to bring the two together in a way that people might see both of them as something they could try." Teams in the competition, which took place in the Purdue Armory on the university's West Lafayette, Ind., campus, had to create machines that would replace batteries in a flashlight using a minimum of 20 steps that employed principles of engineering and physics. All of teams used more than the required number of steps, but the winning machine's 125 were by far the most. "Every year we try to build the most complex machine in the contest," said Hollingsworth, a senior in the School of Aeronautics and Astronautics from Zionsville, Ind. "This year we started planning major steps in September  before we even knew what the task would be  so we could add more steps. This is the most complex machine we have entered." The win earned the Purdue Society of Professional Engineers the right to represent Purdue on Saturday, April 9, in the national contest, which also will be in the Purdue Armory. The team also won the People's Choice Award, which was voted on by the more than 400 audience members. Machines in the competition had three tries to complete two successful runs. Teams lost points if they had to manually assist with their machine during a run. Society of Professional Engineers team co-captain Shawn Jordan, a computer engineering graduate student from Fort Wayne, Ind., said he was relieved during the competition to see a step involving a water balloon to work. "When we were building the machine, we discovered through trial and error that water balloons don't like to cooperate," Jordan said. "You don't know which way they are going to bounce or what they are going to do. When I saw that step work, I was very pleased." Besides Hollingsworth and Jordan, team members are Jason Downey, a junior in nuclear engineering from Goshen, Ind. ; Nathan Flatt, a sophomore in mechanical engineering from Martinsville, Ind. ; Greg Henning, a senior in aeronautics and astronautics, from Indianapolis; Ryan Harold, a junior in mechanical engineering from Wheeling, Ill.; Devin Keeler, a senior in civil engineering from Randolph, N.J.; Maggie Little, a graduate student in the College of Technology from Crestview Hills, Ky.; Robert Mann, a sophomore in civil engineering from Fort Wayne, Ind. ; Andy Mehl, a senior in electrical and computer engineering from Goshen, Ind. ; and Drew Wischer, a sophomore in aviation technology from Manitowoc, Wisc. 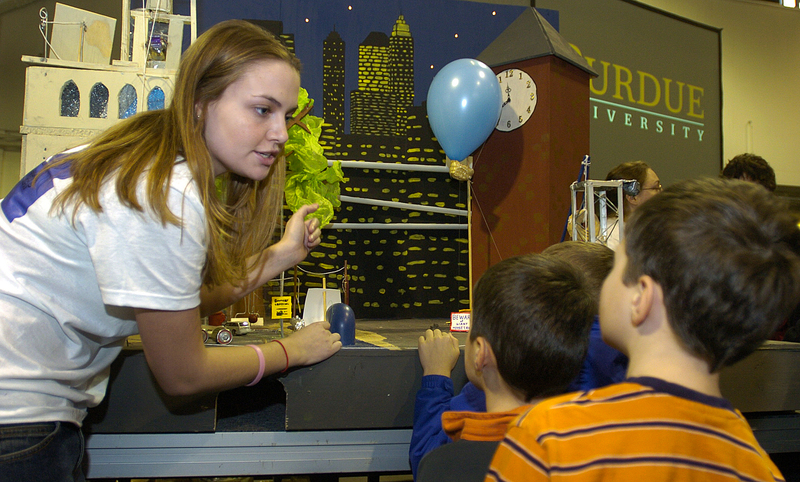 Seven teams from Purdue competed in the annual competition, put on by Theta Tau Fraternity, that pays homage to the late cartoonist Rube Goldberg, who specialized in drawing whimsical machines with complex mechanisms to perform simple tasks. Dan Kleinbaum, contest chair and a sophomore in the School of Mechanical Engineering from Ann Arbor, Mich., said he was impressed by the degree of complexity this year's machines exhibited. "The machines were all outstanding," Kleinbaum said. "Its a step above last year, and to have a winning machine with 125 steps is just incredible. You can tell the amount of work all of the teams put into their machines." Second place went the Society of Manufacturing Engineers, and the Society of Hispanic Professional Engineers placed third. Saturday's contest was sponsored by General Electric Co., BAE Systems and Purdue's colleges of engineering and technology. In addition to successfully completing the task, judges also award points based on creativity and complexity. Last year, the team sponsored by the Society of Manufacturing Engineers took first place with an election-themed machine that used 70 steps to select, mark and cast a ballot. The team also went on to win the national competition. In previous contests, students' machines have been required to select, clean and peel an apple; make a cup of coffee; toast a piece of bread; put a stamp on an envelope; and drop a penny into a piggy bank. Winners have appeared on "Late Night With David Letterman," CBS' "This Morning," ABC's "Good Morning America," NBC's "Today," Newton's Apple" and CNN. Rube Goldberg and the Rube Goldberg Machine Contest are the trademark and copyright of Rube Goldberg Inc. Note to Journalists: Video clips will be posted at the same Web site on Monday, and broadcast-quality video clips are available by contacting the Purdue News Service at (765) 494-2096. For questions or assistance, contact Matt Holsapple (765) 494-2073 or Jesica Webb, (765) 426-1071.